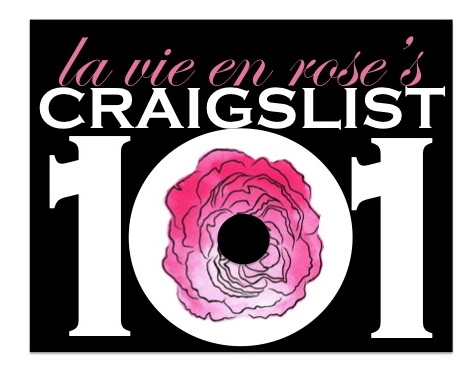 I posted in my BUDGET SERIES about using Craigslist as a way to stretch your income. If you've never used Craigslist before, you should really consider giving it a go. I've mentioned a few times that John is pretty pro at Craigslist. He *loves* flipping items, or turning old stuff in our home into other things that we need for free. That being said- it was pretty surprising that we were scammed a few weeks ago. To be honest- we weren't entirely scammed. We both knew the deal wasn't right, but so desperately wanted to go through with it that we did. Big mistake. Remember, people- if it's too good to be true then it probably is. However, because we always follow certain rules, the scammer is going to be paying us back. Big time. Let me talk to you a little bit about Craigslist today and hopefully you can start cashing in soon, too! 1) Present it. If you want the item to be sold for top dollar, you need to present it well. Clean it up, repair what you can, tighten bolts, etc. You want the item to seem as new and unused as possible. Also, present it correctly in your wording. "Old" is actually "vintage"! When writing your description, make the item sound as appealing as possible. They are losing out if they pass by this item! Also- sell in season. You'll get more for that bike/pool/snow blower/whatever during the season that it is mostly used. People aren't thinking of buying items off-season, generally. Right now, cleaning up sidewalks from snow is the *last* thing on my mind during 100 degree heat. 2) Complete it. Is the item missing parts? Is there something you can add in to make the deal a little sweeter and give your item the edge it needs? For example, when listing our Keurig recently, we included a NIB (new in box) My K-cup Filter + several K-cups. That's appealing because the person can immediately start enjoying the Keurig without having to purchase anything else, so if it comes down to our item or someone else's they will go for ours. 3) Photograph it. How you photograph the item makes a big difference. You don't need to be a professional, but do pay attention. Photograph the item in nice lighting and from a good angle. Be sure to include multiple photographs so that the item is entirely showcased. I never purchase a Craigslist item that doesn't include pictures. 4) Compare it. Before you price it out, check out how much your item sells for new, how much it sells for on e-bay and what other Craigslisters are selling the same item for. If you price it too high, people will pass right over it. But you don't want to low ball either, because most buyers will still want to haggle with you a little bit. a) forms of payment: cash is king, but be careful. If you don't have written proof of how much cash you were given, a buyer could claim they paid more. Never take a check. Paypal in advance is a good option. b) watch out for scammers: we get a scammer with almost every item we list. If they ask you to mail the item BEFORE you receive payment, don't do it. Ever. And if you do use Paypal, be sure that the money is IN YOUR ACCOUNT before sending/turning over the item. Often times people will say they are buying it for their relative and need it mailed. I've been sent SO many phony e-mails from Paypal saying that "the money cannot be deposited in your account until a tracking number is sent to this e-mail address". Bogus. Another tip that you're dealing with a scammer is that they often will offer you MORE money than you listed the item for in exchange that you "take the listing down" and hold it for them. c) make a contract: this is HUGE. Make a contract. After the blackberry incident we started making contracts for everything we sold saying that the item was being sold "as is" and we weren't responsible for anything that occurs after sale. Be honest, though. When we sold my car (and John's mac) on Craigslist, we detailed everything out for the buyers that was currently wrong with each item. A contract isn't an excuse to be a jerk. Allow the buyer to inspect it first before signing and don't try to pull a fast one over them. d) keep it public: Never meet someone at their home, after dark, or in any sort of a private area. I don't care what gender or how big you are. Always meet in a public place during daylight, and bring someone with you if possible. To Buy: Want to buy something? Read on, people! 1) Research it. Before you purchase an item, research about it. What is the latest model and how much does it sell for? Does it have good reviews online? Was it ever a part of a recall? Because you're buying second hand, you need to know as much about the back story as possible. 2) Compare it. If you see something you like on Craigslist, after researching it, compare it to other items that are being sold. How is it priced? What does it come with? As with my Keurig example in the seller section, sometimes you'll be better off to pay a little bit more money for an item that comes with all of its parts (K-cups are expensive) or is a newer model/edition. Also, if you do find that the same model/brand/etc is being sold for less you can use that as a bargaining chip with the seller. a) forms of payment: when buying, I prefer to use Paypal because then you have more protection. If the deal is shady, Paypal can go after the buyer to get your money back. Plus, that way they can't be totally anonymous. Let's say you communicate with your seller via email and then meet in a public location. All you may have is an e-mail address and first name. That won't get you far if you have an issue with your item. Paypal is attached to a bank account! Get a phone number, too. b) watch out for scammers: People will try to sell you junk that doesn't work. Remember to TEST and INSPECT the item before purchasing to make sure it actually works and does what it is supposed to do. c) make a contract: come with your own contract that states what the seller has told you about the condition of the item you are purchasing and make him/her sign it. Be sure to date it and include how much money you paid for the item. Sellers will be much more honest if they have to sign a contract. d) keep it public: again- never meet at a person's home, not even your own. It isn't safe. Bring someone if possible and meet in a public location during daylight hours. That's it! 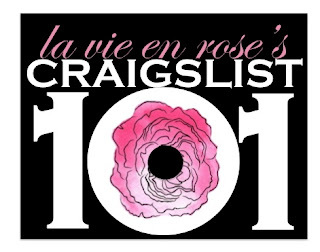 What's your best Craigslist tip? Hopefully you're inspired to look around your house for some treasures you can sell. It's a great way to get extra cash! Plus, buying gently used items on Craigslist saves us tons of money, too. I need to get crafty here soon, I haven't done a project in a while. And it's been WAY too long since I sewed something for 'la vie'. Maybe I'll start sorting through my closet. I hope you managed to stay cool today- all the best and as always, thanks for reading!